Bafana clash: Chukwueze, Omeruo hit Eagles camp today – Royal Times of Nigeria. 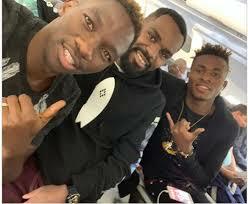 Spain-based centre-back Kenneth Omeruo, Bryan Idowu and Samuel Chukwueze are expected to hit the Super Eagles camp in Asaba today for Saturday’s 2019 Africa Cup of Nations qualifying fixture against the Bafana Bafana of South Africa in Johannesburg. Omeruo, who is on loan at CD Leganes from Chelsea, said this in a post on his instagram page. Omeruo was in action for Leganes in their barren draw with Girona on Saturday, while Bryan Idowu was not listed in Locomotiv Moscow’s barren away draw against Rubin Kazan on Sunday. Meanwhile, Eagles defender Jamilu Collins said he has shaken off an injury and will join up with the team’s training camp in Asaba ahead of the AFCON qualifier. The Super Eagles are expected to hold their first training session ahead of Saturday’s game today. Twenty-three players have been called up by Rohr for the encounter billed for the FNB Stadium, Johannesburg. The duo Francis Uzoho and Odion Ighalo have pulled put due to injuries and have been replaced by Theophilus Afelokhai and Henry Onyekuru respectively. Nigeria top Group E of the 2019 AFCON qualifiers with nine points, one more than Bafana Bafana who sit in second position with eight points. Libya occupy third position with four points, while Seychelles, with one point, are bottom.